For the first time Belgic Magic organised a Gentry tournament. This event took place in the Gentry capital of the world: Ghent. The tournament was won by Dylan Botten who beat Lars Meeussen in the finals. I didn’t make the top-8 cut-off, having finished the swiss portion with a score of 3-2; not a bad result, but not a great one either. I’m not a very competitive player. 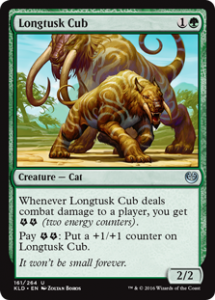 One of the things I enjoy most about Gentry is being able to play whatever you want, so most of the time I play a very janky deck which no one will expect, but which is a lot of fun to play. I really love deck building and it’s unlikely I will play the same deck twice. Because of this and because I was on a holiday the week before the event I didn’t have a deck until the day before. 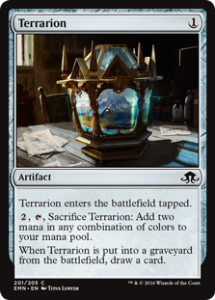 I wanted to play something with burn spells because I had noticed a couple of decent burn spells which became available with the release of Hour of Devastation. After some playtesting I changed the deck a lot. At the time Pepijn told me that Ramunap Red was a deck being played at the Pro Tour in Kyoto and it was performing really well. He advised me to play Ramunap Ruins in the deck along with some other deserts. I heeded his advice and I went back to testing. 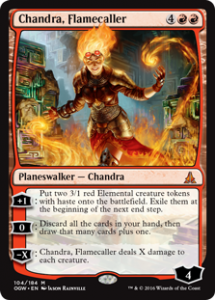 It turned out that Chandra, Flamecaller was too expensive to play in a deck that, at the time, only ran 22 lands. 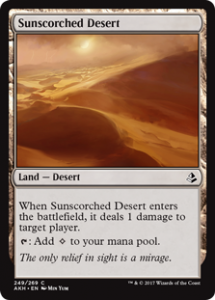 Be adding Ramunap Ruins and Sunscorched Desert to the deck it could now produce colorless mana, so I decided to run Reality Smasher instead of Chandra. 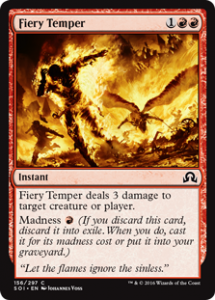 Burn From Within was not performing as I would have liked, because most of the time I would cast it for 3 or 4 mana, which could be any burn spell on a common spot. It was not worthy of a rare spot so I started testing some other rares such as Insult // Injury, Fall of the Titans and Collective Defiance. 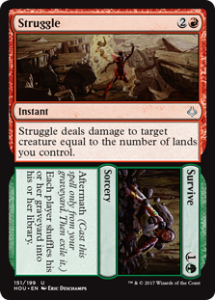 It seemed Collective Defiance was the best pick so I swapped it into the deck. My deck was finished and I was really confident. When I played against Pepijn I had a 60% chance to win game 1, even though he had a lot of lifegain and the matchup was unfavorable for me. I felt like the deck was the least janky deck I had built in over a year and I had a good chance of having a great and bloody victory over my opponents during the tournament. After having some trouble with my printer I asked Pepijn if he could print out my decklist because this would be a competitive event. I was really excited. It had been a while since I last played Magic and was looking forward to it. Also, despite having judged a couple of competitive events, this would be only the second competitive event I was to play in. I left to pick up Pepijn but I got stuck in a bit of a traffic jam, involving several tractors, so we didn’t have much time to spare. We arrived at the Outpost ten minutes before the start of the event. At the beginning of the event, seatings were posted and Floris, the headjudge for the event, made some announcements about the event and the decklists were gathered. The organisers of the event, the lovely people from Belgic Magic, also wanted to give a quick announcement about the Belgic Magic College project. More information about this can be found on the facebook page of Belgian Magic. It was really unfortunate that we had to face each other in the first round. Having tested a lot in the days before, we knew each other’s decklists like the back of our hand. The matchup was still in Pepijn’s favour, but I hoped I could keep getting early wins, before he had enough lands or mana dorks to gain life from his big beasts. Game 1 started with Pepijn casting a lot of mana dorks (I think he cast 5) but I could clear them all with a combination of Hungry Flames, Shocks and Fiery Tempers. While doing this I brought him to 4 life. I had a Bloodrage Brawler on the field and an Open Fire in hand so I was confident I could win. If he cast a dork I could clear it and hit for lethal or if it was really neccesary I could cast the burn spell this turn and activate Ramunap Ruins next turn. 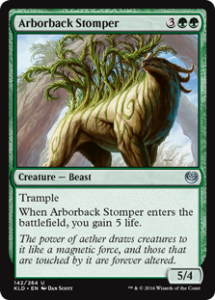 Pepijn casted an Arborback Stomper, gaining him 5 life so it became more difficult for me, but I was still confident. The stomper and brawler traded and I burned him for 3, he went to 6 life. 6 life is something I can handle, I can draw whatever burn spell for 3 and sacrifice 2 deserts, I can get there. 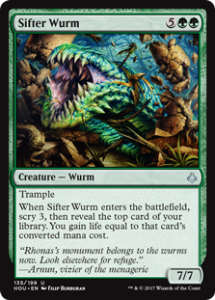 Next turn, Pepijn casts a Sifter Wurm revealing an Ulamog, gaining 10 life. Unfortunately, I had to concede the game. I sideboarded against Pepijn and decided to put 2 Hijacks in my deck so I could steal his big creatures. I removed 2 Cathartic Reunions from the deck because I know Pepijn splashes blue only for some Negates and Dispels and it would be really painful if he could counter a Cathartic Reunion after I had already discarded 2 cards. I started game 2 with a strange hand: 1 Sunscorched Desert, 4 Mountains and 2 Bloodrage Brawlers. I wasn’t sure if I should mulligan, but decided to keep the hand as it was very aggressive and Pepijn had to trade his mana dorks with my brawlers in order to survive. After drawing a burn spell on turn 2 I drew another brawler at turn 3 wich I could cast immediately. Pepijn had a very slow hand, he played a Druid of the Cowl on turn 2 and searched for a land with Beneath the Sands on turn 3. I kept hitting him with the brawlers until he only had 3 life left. He played an Arborback Stomper and killed one of my brawlers with Struggle // Survive. I had only two Brawlers left, but I kept hitting and he traded one Brawler for his Arborback Stomper. Pepijn played a Druid of the Cowl in order to survive. With only one brawler left, Pepijn was at 4 life. I cast a Hijack on the mana dork and hit for lethal. Game 3 was a very sad game. I had a decent, but not great hand in contrast to Pepijn who had a great hand. I had some burn spells so I could clear some dorks but he had a lot so I couldn’t clear all of them. On turn 4 he had 7 mana so he played an Arborback Stomper and activated Duskwatch Recruiter‘s ability at the end of my turn, revealing another Arborback Stomper. This would be hard, but it was still possible. I was prepared for the next stomper coming up in his 5th turn but sadly he played a Sifter Wurm. He started scrying, but I scooped, I had only 2 cards left in my hand, one of which was a land and I could never have killed the worm. Very unfortunate, but hey, this is still Magic, the luck of the draw is a big part of the game. I’ve known Ian for some time now and he’s a person I really enjoy playing against. Ian is a very friendly person and although he really is serious while playing we make a lot of jokes while playing. Ian also plays a homebrew and he told me he made his deck 5 minutes before the event. He has the same strategy as me as he wants to kill me as fast as possible with a very aggro deck. He plays some burn spells but in contrary to me he has fewer of them and plays more creatures. The first game goes really fast. 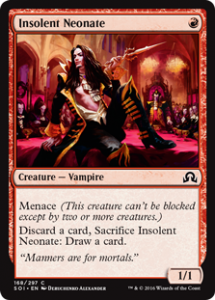 Ian plays some small thread like Insolent Neonate and Flameblade Adept, and a somewhat stronger Bloodrage Brawler discarding Fiery Temper. Ouch. Using shock and 2 Hungry Flames I could remove the creatures and burn him for 4 points of damage. In turn 5 I played a Reality Smasher and attacked him for another 5 points of damage. Ian played another Insolent Neonate, but when I attacked with the Reality Smasher and a freshly played Glorybringer he scooped up the game. The second game proved more of a challenge. Ian played a lot of small creatures for which I had no answer. When Ian had an Insolent Neonate and a Flameblade Adept in play, I only had a Thermo-Alchemist with which to defend myself. During his turn Ian casted Insult // Injury and attacked with both his creatures. I doubted but took the full 6 damage, which was hard. For the first time while playing this deck I’m pushed to defense. Ian kept casting creatures, but luckily I drew some removal spells and managed to clear the board. 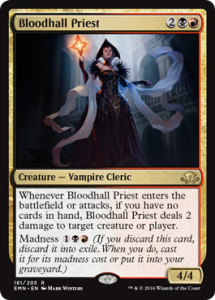 Finally, when Ian had already dropped me to six life, only a single Bloodmad Vampire, with one counter on it, was left for my opponent. 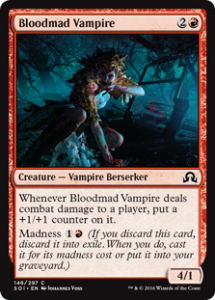 I cast a Bloodrage Brawler, discarding Fiery Temper to kill the Bloodmad Vampire. Ian had no card left in his hand and had to rely on the top of his deck. I simply kept on attacking with the Bloodrage Brawler, burning his creatures and securing my victory in the second round. I don’t know Bob very well, but I had already played him a couple of times. As a member of Team Wrecking Ball, Bob is known to be a very good and experienced player and nothing I’ve experienced contradicts that. Bob knows what he is doing, when he is playing Magic, but he is also very friendly and fun to play against. I won the first game against him. He didn’t really know what I’m playing, which tipped the scales in my favour rather considerably. I, on the other hand, had already heard he was playing a Jeskai (white, blue and red) control list. In theory, Bob was favoured for this match-up, playing a control deck and having access to Blessed Alliance, a very hard card for me to beat. 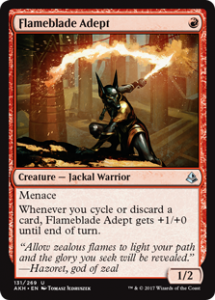 Not only can he make me sacrifice one of my attacking creatures, he can also gain 4 life, which is not a very fun prospect if you are trying to burn your opponent down. So in the first game I started by playing 2 Thermo-Alchemists. By pinging Bob and casting Open Fire I brought him down to 14 life. Bob didn’t have an answer, but he was digging through his deck with Glimmer of Genius. He found the answers he was looking for and was able to remove my Thermo-Alchemists, but then I was able to resolve a Reality Smasher, which made the game even harder for him. Bob played a Thraben Inspector, but I simply kept hitting him with the Reality Smasher and brought him down to 1 life. Bob had 4 lands untapped and I knew there was a possibility he had a Blessed Alliance in hand. Because of this I decided to sacrifice a desert to Ramunap Ruins before I declared my attackers. This way he would have to use the Blessed Alliance to gain life before combat and he then wouldn’t be able to make me sacrifice my Reality Smasher. Bob did indeed have a Blessed Alliance which he cast and I hit for lethal with the Reality Smasher. Game 2 was totally different. I started with a strange hand, it contained a Ramunap Ruins, a Sunscorched Desert, a Bloodrage Brawler and some burn spells. I decided to keep, but Bob mulliganed to 6. 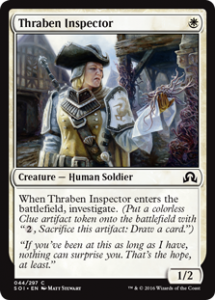 He started the game by casting a Thraben Inspector, a white staple for Gentry. In my second turn I casted a Bloodrage Brawler which Bob countered. 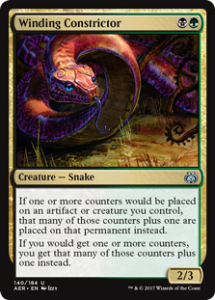 Thank Bolas you only have to discard a card when it enters the battlefield. Bob attacked with the Thraben Inspector and went on to control’s infamous Thraben Beatdown plan. 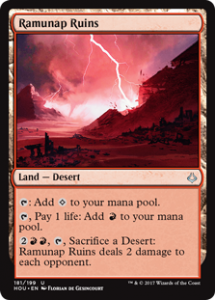 Turn 3, I didn’t draw an extra land, which was very painful, because you have to pay life to create red mana with Ramunap Ruins. I cast a Tormenting Voice in order to dig deeper in the deck in search for land, but Bob cast Negate. I lost 3 cards and Bob only lost one which put me at a severe disadvantage. And I still couldn’t find a land. 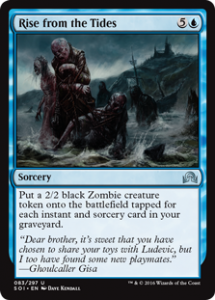 When Bob played a second Thraben Inspector and cast a Rise From The Tides for 6 zombie tokens, I scooped up my cards. The score is even, 1-1, these are the kind of games you want to play; against a very good opponent who is playing a very good deck. You can enjoy and learn from these games. The third game started with an Ember-Eye Wolf which I sideboarded in to make my deck faster, but Bob cast Magma Spray (a card he sideboarded in) on my wolf. I managed to take Bob down to 10 life, but I only had 3 cards left in my hand and Bob had cast Anticipate twice and played some other card draw spells. He had a Thraben Inspector in the game while I had no creatures of my own. I drew my card for the turn and got a Collective Defiance. My hand at this moment was Shock, Bloodrage Brawler, Reality Smasher and Collective Defiance. Bob had all his mana untapped and I was not sure what to do next. I wanted to cast my Reality Smasher and try to bring him to 1 life, but I knew it would have been countered if I tried this. I could have tried to cast the brawler, discarding the burn spell, hoping Bob would counter it, and then I could have cast the Reality Smasher, but I would have needed one more mana for this line of play. I tried something else. I cast Collective Defiance and escalated it 2 times. I removed the Thraben Inspector from the battlefield, burned Bob for 3 points of damage and made him discard his hand. I hoped this would be favourable for me as he had already anticipated twice and hopefully I could make him discard some really good cards. Turns out I was half right in doing so. 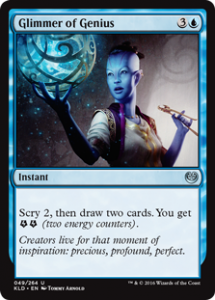 As Bob discarded his hand he revealed he had indeed been holding an Essence Scatter which could counter my creatures, but he also discarded a Rise From the Tides which is one of his win conditions as seen in the previous game. I was glad I got rid of those, but I couldn’t have known that Bob would draw into Chandra, Flamecaller and his Torrential Gearhulk by drawing 6 new cards. Next turn Bob cast his Chandra, uses her +1 ability and started hitting for 6. I tried to stall the game by shocking one of the elementals, but Bob brought me down very quickly. I was still weary of the counterspell, so I couldn’t cast my Reality Smasher to kill Chandra or Bob. Bob cast another Thraben Inspector and kept attacking. I could resolve my Bloodrage Brawler (which Bob decided not to counter) but was pushed into a defensive position again and I had to trade it off for one of the elementals. I couldn’t kill Chandra, and ultimately she (and the Thraben Inspector) killed me. After the game had ended Bob told me he had a Torrential Gearhulk in his hand in order to flashback a counterspell. My fear of my Smasher being counter was not unwarranted. Sadly enough, I lost and I had a 1-2 score, so my hopes for a top-8 were crushed. But hey, I wanted to play Gentry, so this wasn’t going to stop me from playing another round! I didn’t know Robbert and I had never played against him. I didn’t know what he was playing, but I did know that Robbert was one of the coaches of the Belgic Magic College. I had been somewhat distracted during the presentation of the coaches, so I wasn’t aware of all of his accomplishements, but I assumed there were a lot. Because of all these uncertainties, I decided to play very carefully and to watch out for unknown situations. We rolled to see who would start and I won! This was the first time I got to go first, so I decided to take the initiative and start. The first game started off rather slowly. On turn 1 Robbert casted Terrarion. On my second turn I cast Thermo-Alchemist and Robbert cast Prophetic Prism. I really didn’t know what to expect. I didn’t know any decks that played so many artifacts, except for UR improvise, but I didn’t remember that deck playing white mana, which Robbert did. On my third turn I could force some damage through by casting a Tormenting Voice and casting Fiery Temper for its madness cost to his face, while pinging him with the Alchemist. Sadly, Robbert exiled my Thermo-Alchemist with Cast Out. Turn 5 I cast Glorybringer and attacked for 4 damage, but Robbert responded by casting Nahiri, the Harbinger and used her ability to exile Glorybringer. I get rid off Nahiri with Shock and I cast some burn spells on Robbert. By now there is an army of artifacts on the battlefield, which are doing nothing so I’m wondering if he’s going to do something with them. Robbert cast a Cloudblazer which I quickly removed with Open Fire. Cloudblazer healed Robbert back up to 10 life, but I cast an Inferno Jet bringing him once again down to 4 life. The next turn I cast Hazoret the Fervent and attacked for 5, but Robbert cast Blessed Alliance, choosing to escalate it, making me sacrifice Hazoret and bringing him up to 7 life. My next turn was kind of insane. I cast Cathartic Reunion discarding a Fiery Temper and a land, cast the Fiery Temper which brought him down to 4 life. Cathartic Reunion drew me into Tormenting Voice, Fiery Temper and Sunscorched Desert. I cast Tormenting Voice, discard and cast Fiery Temper, bringing him down to 1 life. I finish the game by playing Sunscorched Desert which pings for lethal. I still had no idea what Robbert was doing or how he intented to win the game. 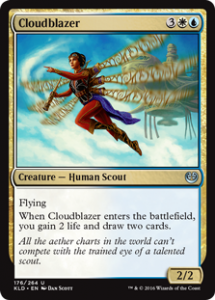 Nahiri isn’t a card you see a lot in Gentry so Roberts intentions weren’t clear to me. Game 2 also started with some artifacts at Robberts side. On my side I resolved a turn 2 Thermo-Alchemist. The turn 3 Firebrand Archer gets countered by a Metallic Rebuke, but on turn 4 I cast another Thermo-Alchemist which is hard for my opponent to deal with. 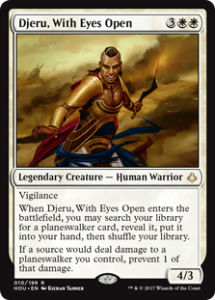 Robbert cast Djeru, With Eyes Open searching for his Chandra. 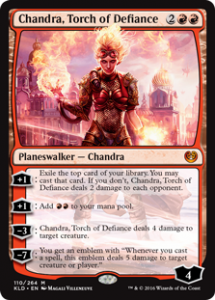 I was able to kill Djeru with Open Fire, before he could attach it and I would have taken damage, but I was sweating at the thought of having to deal with a Chandra. 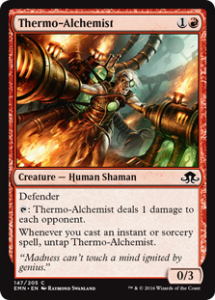 Next turn Robbert did indeed cast Chandra, Torch of Defiance and used her to deal 4 damage to the remaining Thermo-Alchemist. 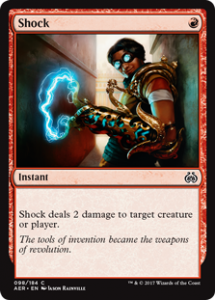 I was very happy he did this, because now once again Shock would be enough to destroy this very powerful planeswalker. Next turn I managed to resolve another Thermo-Alchemist and a Firebrand Archer. I cast Tormenting Voice and pinged twice while Robbert cast Hieroglyphic Illumination in order to look for an answer. He clearly didn’t find one as the Tormenting Voice resolved. Meanwhile, Robbert is at 10 life and I cast a freshly drawn Incendiary Flow targeting Robbert. Robbert scooped up the game and showed me his hand containing 5 lands. Bad luck for him, but I was happy I beat the pro player and I felt really confident about my deck. 2-2, my score wasn’t bad and with a lot of luck I could still make it into top 8, but when checking the standings my resistance wasn’t at all good. Top 8 was quickly becoming less and less likely. But still, playing Gentry is tons of fun and I was going to enjoy every minute of it while trying to beat my next opponent, who was going to be Laurent. Laurent is a friend of mine and one of my fellow judges at the League Of New And Beginning Magic Players. I knew what he was playing but I already forgot so I was looking forward to another match full of surprises. From experience I knew Laurent was a very good player, thinking deeply about every move and because of this he tended to make very little mistakes. I, on the other hand, am a very impulsive player. This could have put me at a disadvantage, so I was going to try to think every move through and try not to make mistakes. If I was going to have any hope of making top 8, I needed to win. The first game was a really sad one. Laurent got mana screwed, which was good for me, but it’s always sad to win a game this way, there is no fun in such games for either player. Because of the screw Laurent was only able to cast creatures with a mana cost of 2 or less, of which he had a couple (Longtusk Cub, Thriving Grubs and Winding Constrictor) but I was able to clear them all using 2 Hungry Flames and Fiery Temper, which I played together with a Tormenting Voice so I could even get more advantage in this sad game. I finished him off with a Glorybringer, which to my mind brought a really sad glory. In the second game, Laurent wasn’t screwed anymore and we could play a normal game. Laurent started off by casting Attune with Aether on his first and second turn and a Scrounging Bandar on his third turn. I played 2 Thermo-Alchemists and killed the Bandar. 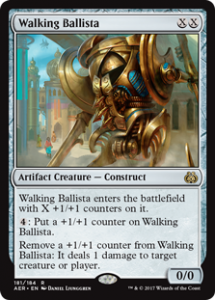 Turn 4 Laurent played an Untethered Express which he crewed with a Walking Ballista with 3 counters on it. I tried to clear the Ballista using a Fiery Temper and in response Laurent killed off one of my Alchemists. Laurent attacked with the crewed vehicle and hit me for 5 damage. Next turn I cast Hazoret and attacked. 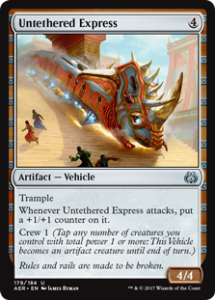 Laurent once again played a creature (Winding Constrictor) which crewed the Untethered Express and hit for 7 damage. Next turn I cast a Firebrand Archer and a Hijack to borrow the Untethered Express from him. I don’t think Laurent will be letting me borrow anything from him again in the near future, because when I crewed it with Firebrand Archer, and attacked together with Hazoret, they hit for lethal. Everything considered, I didn’t play that bad, and my score wasn’t very bad either, but I was disappointed I hadn’t done better. Still, I enjoyed myself a lot and that’s what Magic is all about. As you could have probably inferred from the name, the top 8 consisted of 8 players. Congratulations to all of them, especially to Dylan, who won the event, big thanks to Belgic Magic for organising this fantastic Gentry tournament and to Floris and Frederik for being fantastic judges! I hope to meet you in a bloodrage brawl at the next Gentry event!